handheld moisture meter, providing the operator with temperature..relative humidity..dew point.. and a tremendous amount of other information to help that operator find potential areas of moisture. 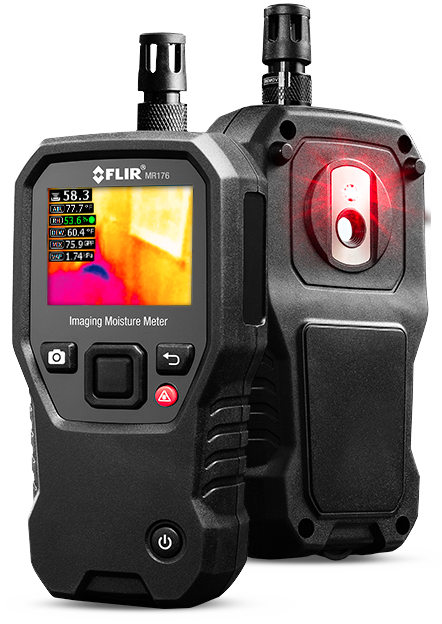 The device also allows for the operator to capture thermal images for later review and application to reports and claims. With this new technology, the operator can pinpoint areas that need to be checked for moisture, and then use either the pinless, or intrusive systems to check building material for moisture. All Jersey is happy to continue to provide the latest technology to our clients so that you can be confident in the results you get. The days of companies coming to your home and “poking and praying” should be over. See the attached link below for all of the specs on our latest equipment. Please call us to come out and demonstrate what we can do for you. Time is money, and don’t waste time any longer looking for those leaks that never seem to show up when the repair man gets there. Quickly scan and target moisture issues. The MR176 visually guides you to the spot where you can confidently take measurements and analyze readings. An integrated pinless sensor and an external pin probe provides the flexibility to take either non-intrusive or intrusive measurements. Includes four colour pallets to help you identify what is being visually shown.